This dresser is hand made in our own UK workshops. 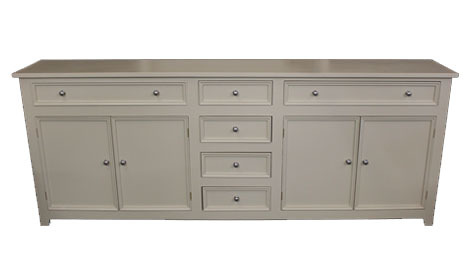 The one illustrated has a painted pine top and has been finished in Farrow & Ball 201 "Estate White". The table below shows our retail prices in GBP and do not include VAT or shipping/delivery. The height of each dresser is 2.67ft (813mm), unless stated otherwise. Discounts apply for Trade Buyers - Contact us to request our Trade Price List, let us know if you are a stocking or non-stocking dealer and also provide us with your full business name and address.